It is time for the monthly update to Clockwork Empires! 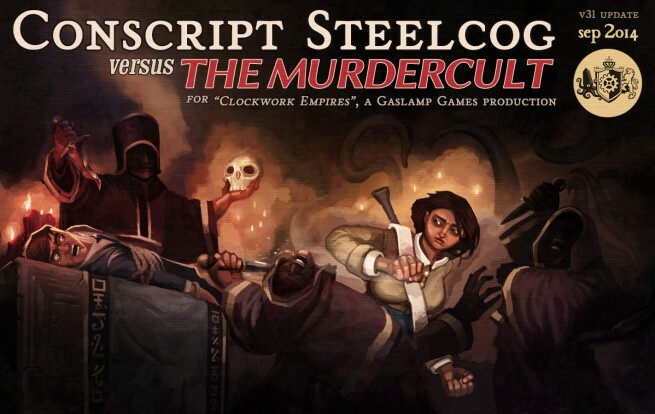 This month is v31, or as we like to call it, Conscript Steelcog versus THE MURDERCULT. This being a monthly update, the changes will go live to every Clockwork Empires player via Steam. We have also updated our Clockwork Empires: Development Progress report! Please check it out if you’re interested in the overall status of the Clockwork Empires project broken down into excruciating detail along with pictures of cats. Fishpeople now have guns, feelings; may eat your colonists. And much more! Everything is basically better, details below. Added a significant number of new memories for citizens to experience. Alerts can be put on job requirements when job requirements fail, with snooze timers. Gabions can be built and work! Build gabions! new food commodities added: preserved orange cup fungus, preserved white cup fungus, sugar loaf, molasses, rum, chicha, moonshine, maize, maize stew, coconuts, coconut curry, chillies, etc? sounds added to tilling soil, for real! What’s the ETA to the Mac release? As per the FAQ on clockworkempires.com, we plan to release the MacOS version some time in October. Wow! A huge patch! I will eat, take a nap and THEN launch CE and see, if I can break it spectacularly. Regarding the REDACTED: My wife suggests the introduction of a REDACTYL in tropical biomes. I think she’s right.